Luxurious European style residential hotel towering in nature! Shilla Jeju is located in Chungmoon Resort, the luxurious resort surrounded by the great nature and cobalt blue ocean. The hotel opened in 1990 as the 1st chain hotel of Shilla hotel, the famous Korean hotel for its high-class service and noble atmosphere. 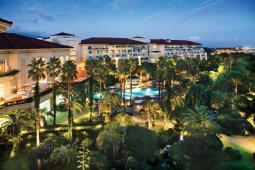 The hotel is popular among honeymooners, families and couples as it is the high-class European style residential hotel. You will lose track of time with the view of the great nature from a guestroom window. The hotel is also famous for being featured in famous Korean dramas and movies. There are 429 rooms with a selection of standard room (double, twin, family type), Korean ondol room, terrace room, pacific deluxe room and 7 types of suite rooms with either mountain view or ocean view. To match the image of a resort, rooms are decorated with light pastel tones. The hotel also has 6 restaurants/bars, 7 banquet halls which are the largest and most diverse halls in Jeju, indoor/outdoor pools, sauna, fitness club, casino, etc. Guests can stay in an elegant and relaxing mood! Guests are encouraged to visit Soombi Garden, the garden surrounding the hotel in the morning or free time. The garden is the popular site in Jeju where many tourists visit every day. Agave plant, which blooms only once in 100 year is planted in Soombi Garden.